There are 12 images tagged with “valley”. 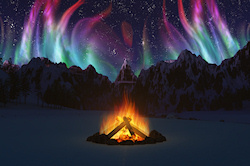 If you follow the path in Welcome to the Cwm down to the bonfire and look to the right, you might see the Northern Lights. You are expected, just follow the lights. 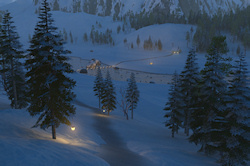 Here&apos;s a winter/fantasy scene in the “cwm” in the mountains that I&apos;ve used for several other pictures. This time it&apos;s winter, and the solitary cottage dweller is expecting company. I like to get plenty of use out of settings once I build them, so this render is around the corner to the left of my Cwm Solitude scene. 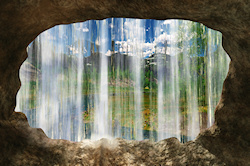 I wanted to create a waterfall in the scene itself - often they&apos;re just a flat plane with a waterfall image that placed in the scene, or the waterfall is added later in PhotoShop. But this is an actual 3D waterfall that works from different angles. Eventually I hope to do another picture looking the opposite direction down the stream into the valley. It&apos;s rhododendron season in the Blue Ridge Mountains! This photo was taken at Craggy Gardens along the Blue Ridge Parkway in North Carolina. I like the word “cwm”, the way it&apos;s spelled and the way it sounds as well as the meaning. I would love to have a solitary retreat in a cwm like this. But this is my digital artwork, not a real place. This was probably my last picture created with Terragen 3D landscape generation software, before I moved on to using Vue instead. 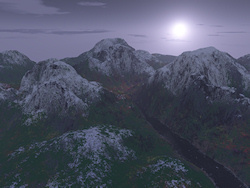 That old version of Terragen was pretty limited as 3D software goes, but it was a good start to digital landscapes, and I think this is a good picture to end on. I was experimenting with sunsets. The original render was much more red and quite hazy, but if I adjusted the colors too much I lost the green of the grass. Hopefully this hits a happy medium! 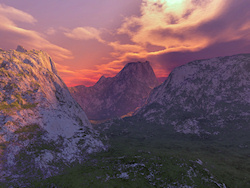 I used Terragen for this mountain-scape. No plants or other objects, but I was able to use the terrain coloring to suggest vegetation and rocks. It makes me think of Yosemite National Park. All three mountains bear some resemblance to the Half Dome there.